How do you know when a promise is kept? Ask that question of a business colleague who has adopted agile methods to speed their delivery of products and solutions to their customers and you may get an answer that surprises you. A successful business approach – one that accelerates cash flow from the top line to the bottom line – would seem like a promise that can be measured. Many C-level executives, though, are finding that measuring agile is more challenging than they would have thought. What’s invisible is difficult to measure. MyObjectives is both a strategic and an operational tool that builds alignment between objectives and company goals. To make work fun (and habit-forming) game mechanics keep your teams communicating with one another on their progress, earning badges and awards as they complete work. The C-suite benefit of this approach is visibility: Visibility into how the self-managed, customer-focused, multi-disciplinary teams are building and aligning objectives to the company’s goals; visibility in to how progress is being made, where assistance is needed and rewards are deserved. A multi-disciplinary approach to multi-disciplinary teams. 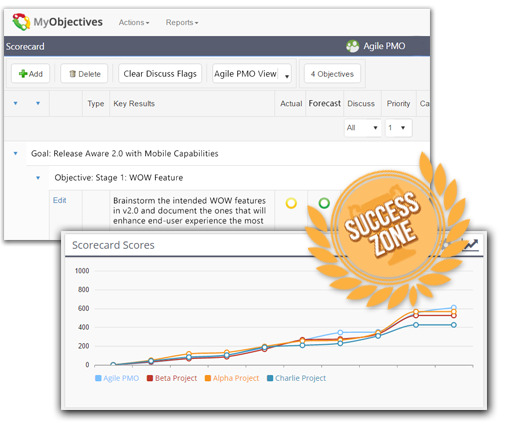 Agile teams form for any appropriate reason, focusing on a particular goal. They should be allowed to use a performance management philosophy that is appropriate to them. 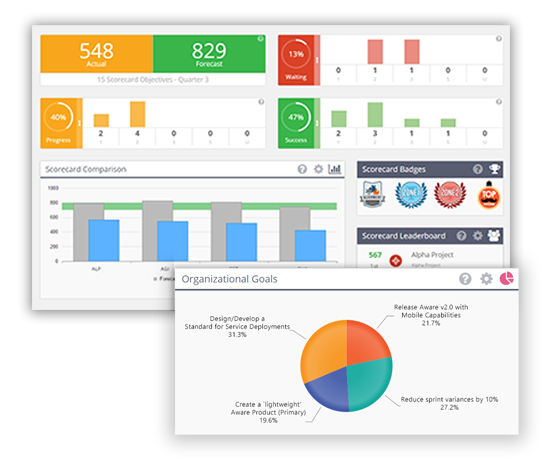 Does your Project Management Office (PMO) or company culture dictate a Balanced Scorecard approach, or Objectives and Key Results? If the organization hasn’t picked out an approach, teams should pick their own. MyObjectives is built with a depth of design and ability to operate either way or as a hybrid. 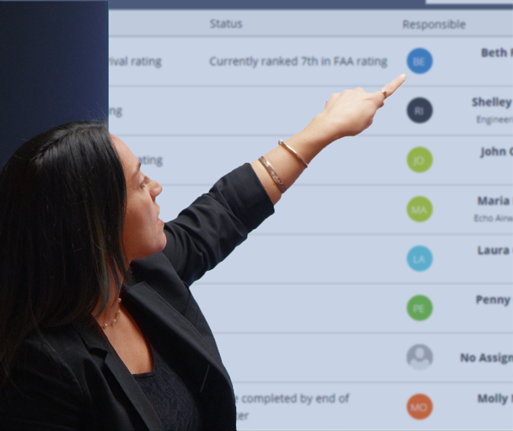 Team scorecards roll up to department, divisional and corporate scorecards, giving top executives visibility into the work being accomplished at any level, regardless of discipline, regardless of management approach (OKR or BSC). Studies show that most people prefer to achieve success in their employment roles. Work that is challenging, fulfilling, and successful is fun. 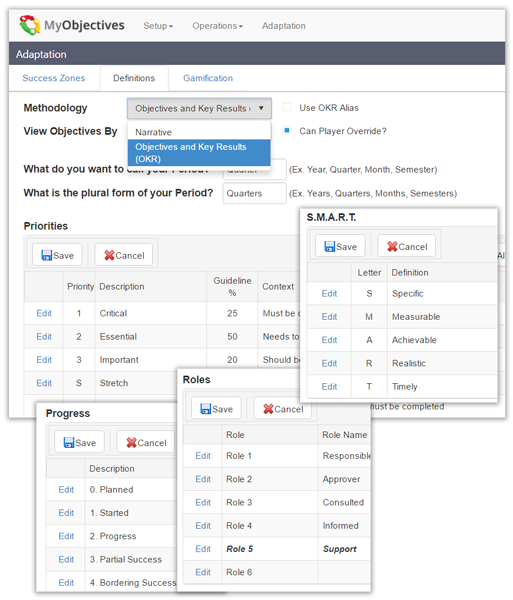 MyObjectives emphasizes role clarity, objective clarity, and S.M.A.R.T. evaluation of objectives. These attributes are key indicators of a successful strategy: When you can measure their pervasiveness in your organization you are better equipped to judge, or forecast, your team’s climb to success. Against a backdrop of a national average of only 30% employee engagement, MyObjectives facilitates goal achievement in an agile methodology through clear visibility of goals, objectives and progress, with teams focused on the work that means the most to the company. And having fun while doing so, fun because of the game mechanics to be sure, but also because accomplishing goals is fun and rewarding. Ready to Dig Deeper? Let's work together to meet your needs.